Saint Patrick was a real person, like most saints. He was born around 387 A.D., and he died around 460, or 492 A.D. His feast day, like most, is celebrated on the day of his death, March 17. His birth name was actually Maewyn Succat – it wasn’t until he was in the Church that it was changed to Patricius, or Patrick. 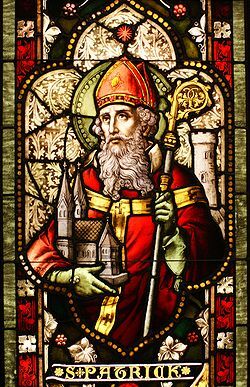 Saint Patrick, the Apostle of Ireland, was born in Kilpatrick, near Dumbarton, which is in Scotland. At the age of 16, he was kidnapped by Irish raiders and enslaved as a shepherd for six years . He wrote that his faith grew in captivity, and that he prayed daily. After six years he heard a voice telling him that he would soon go home, and then later, that his ship was ready. Fleeing his master, he traveled to a port, two hundred miles away, where he found a ship and, after various adventures, returned home to his family, now in his early twenties. He attributed his ability to persevere to his faith in God. After becoming a cleric, he returned to northern and western Ireland as a Romano-British Christian missionary and an ordained bishop, but little is known about the places where he worked. By the seventh century, he had already come to be revered as the patron saint of Ireland. Saint Patrick is the primary patron saint of Ireland, joined by Saints Brigid and Columba. Calpornius, his father, was a deacon, his grandfather Potitus, a priest. St. Patrick used a three-leafed shamrock to explain the Holy Trinity to pagan Irish, forever linking the shamrock with him and the Irish in the popular imagination. He would tie shamrocks to his robes, which is why the color green is worn. Popular folklore attributes the fact that there are no snakes in Ireland to Saint Patrick, who, according to legend, drove them all out, and as a result, there are no snakes in Ireland, to this day. True enough, there are no snakes in Ireland. However, there never were. The icy waters that surround the island country prevented snakes from ever migrating there, to begin with. Green may be the national color of Ireland, but the color most associated with St. Patrick is blue. The Order of St. Patrick was established in 1783 as the senior order of chivalry in the Kingdom of Ireland. The color associated with the honor needed to differentiate it from the Order of the Garter (dark blue) and the Order of the Thistle (green). So they went with blue. The first St. Patrick’s Day parade was held in the U.S. The Irish have been celebrating the feast of St. Patrick since the ninth century, but the first recorded parade anywhere was in Boston in 1737. The parade was not Catholic in nature, though, because the majority of Irish immigrants to the colonies were Protestant. Ireland did not have a parade of its own until 1931, in Dublin. Even today, 18 out of the 20 largest St. Patrick’s Day parades are in the states – New York’s is the largest. While, in the United States, and elsewhere, we all wear green to celebrate Saint Patrick, in Ireland, only Catholics wear green, while protestants wear orange. Green and orange, two of the three national colors of Ireland, represent the Catholics and Protestants, respectively, with white, the third national color, representing the truce between the two, on the National Flag of Ireland.